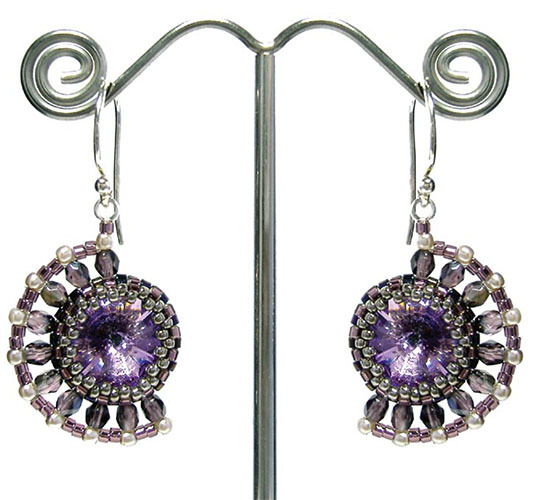 These earrings are made by first creating a bezel using the peyote stitch to hold the rivoli. Next, use right angle weave and netting to add 3mm fire-polished beads, 2mm round beads (gemstone, glass pearl or fat 11/0 seed beads) and Delica beads around this rivoli base. 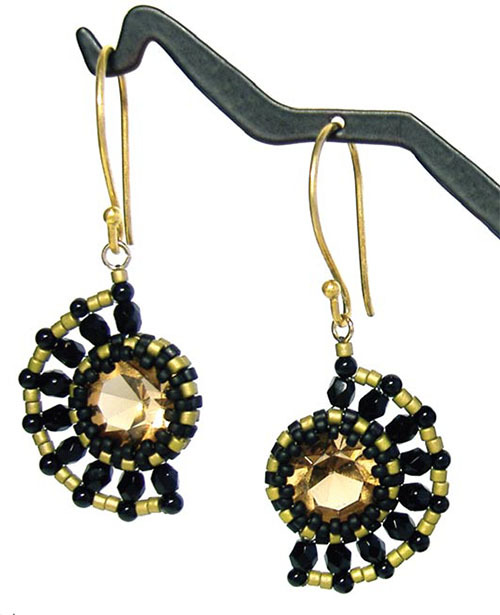 The pattern is fully illustrated with detailed step-by-step instructions for using size 12mm rivolis (pictured on left), with directions included for using smaller size 47ss (about 10.7mm, pictured on right) Swarovski #1122 (with flatter foiled backs similar to the 12mm rivoli) and 47ss Swarovski #1100 (pointy backs, currently discontinued but widely available as vintage rivolis).